Come and experience real Ozark Hospitality. 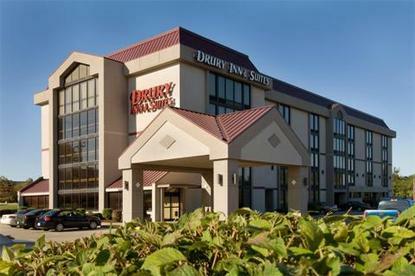 In the heart of the Ozarks stands the Drury Inn & Suites - Springfield. Located just off I-44 on Glenstone Avenue it is just minutes to Bass Pro Shop, Downtown, and a wide variety of restaurants and tourist attractions. This hotel offers 110 standard guestrooms and two-room suites. The suites provide a relaxing atmosphere, which include separate bedroom and living areas. Drury owns and operates all of our hotels so you can expect the same great value, friendly service, cleanliness, and comfort at every location.We're pleased to let you know that sections of the Drury Inn & Suites Springfield, MO will be under improvements to serve you better from November 21st to February 28th. All work takes place between 8:00 a.m. & 5:00 p.m. Drury Inn and Suites Springfield is located at Interstate 44 and Glenstone Avenue (Exit #80A), less than three miles from Southwest Missouri State University, shopping, the Payne Stewart Golf Course and the Air Military Museum.